David Rio’s Power Chai Espresso, inspired by ‘Dirty Chai’ (a popular drink made in cafés by adding a shot of espresso to a cup of chai), is now available for easy preparation at home. Just mix with milk or your favorite milk alternative. 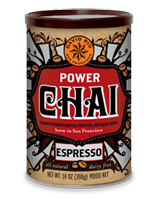 Power Chai Espresso is an artisanal, all natural and vegan product. David Rio has added quality espresso from Brazilian coffee to black tea and spiced it with ginger, clove, cinnamon, star anise, cardamom, and a touch of black pepper. It’s the perfect balance of chai and coffee! Each 14oz canister makes about 18 cups. INGREDIENTS: Cane sugar, maltodextrin, black tea powder, natural flavors, expresso made from Brazilian coffee, natural spice blend, salt. 1. Pour 8oz of hot milk or milk alternative over 2 Tbsp of chai (add more or less chai to taste). 1. Combine 2 Tbsp of chai with 2oz of hot milk or milk alternative. 2. Pour over a cup of ice. 3. Blend well and enjoy. 1. Combine in a blender 1/2 cup milk or milk alternative, 3 Tbsp of chai, and 1 cup ice. 2. Blend well and enjoy.